Attention. the doses of peeled tomatoes can change depending on the water percentage contained in tomatoes. Press the peeled tomatoes until a purée. Put the tomato purée into a pan, boil over high heat and stir. As soon as condensing low the heat or stop if you wish the tomatoes pukp. 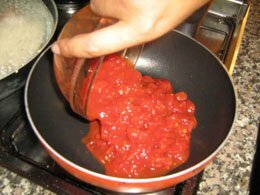 This first step produces the tomato purée, used in many recipes as basis for the sauces.